Many think Churchill's achievements during the greatest period in his life, the Second World War, called out an aspect of his character and ability suited for that unique circumstance but not for most others in which he lived. Churchill's Trial is an attempt to discover that something. Active in politics for 55 years that spanned the most traumatic events so far in history: the greatest wars, the greatest depression, the greatest political transformations, the greatest social upheavals, the greatest advancements of technology and therefore of human power, Churchill left one of the richest records about his life and actions. Today we all face obstacles and necessities and we all spend much of our time doing things that we must do, often things we would rather not do. For the statesman, these things are both numerous and grave: numerous, because peoples and the matters that concern them are myriad; grave, because they involve justice and injustice, life and death. To cope with them is a special capacity and art. The ability to cope with them is constantly and urgently required, but those who can do it at a high level are not common. There are lessons to be learned both positive and negative, from Churchill's life and leadership that can help us to live our own lives, cope with our own problems, and serve the cause of our own country as it appears today. 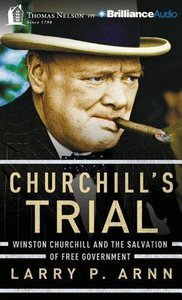 About "Churchill's Trial (Unabridged, 6 Cds)"